The aim of the Feed and Read Program is to reduce hunger and reading loss during the summer months. The Feed and Read program provides nutrition, mentoring, and free books to low income children during the summer school break. By mobilizing a network of community centers and churches United Way runs 18 Feed and Read sites open to the public during the summer. Each site provided lunch for the children, half through the USDA Break Spot program and the other by utilizing their own center’s kitchen resources. 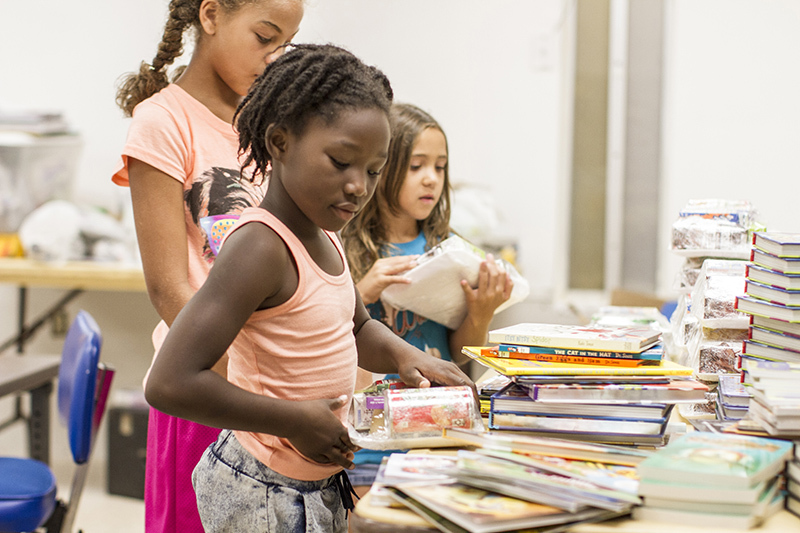 Some centers may require participation in the program to work with the mentors, but all public sites will provide books and meal packs weekly. United Way also has reading mentors who volunteer at the Feed and Read sites. They provided one-on-one and group reading opportunities and encouraged independent summer reading. Each child will receive reading-level appropriate books to keep as a personal library. Last summer a total of 30,000 books were provided to the 4,000 participating children. To complement the Feed and Read effort, Project Hunger funds were used to purchase more than 15,000 back-pack meals that the neediest children received for at-home consumption. In addition, thanks to Project Hunger, we were able to give out fresh fruits and veggies! United Way of Brevard assists the efforts of Project Hunger as part of our commitment to improve the health of our community. Project Hunger is a grassroots group focused on providing food to hungry kids during the summer months when kids do not have access to free and reduced price lunches provided at schools during the school year. Project Hunger began as an emergency appeal in 2009 as the ‘great recession’ began and has raised over a half million dollars to fight childhood hunger in Brevard. The intent for Project Hunger was to be a time-limited appeal to address the concerns of childhood hunger during the summer months, but the concerns continue. This year marked the 10th year of the Project Hunger Summer Feeding appeal. Over the last ten years this committee and our generous community have raised $870,500! That has resulted in 603,843 meals for children over the summer months. During the 2018 appeal Project Hunger raised $75,554. Project Hunger raised $64,427 to support United Way's ﻿Feed and Read Program. In 2017, we served 4,800 children, distributed more than 20,000 free, brand-new books and 15,000 take-home food packs. Project Hunger funds continue to fund the growth of the United Way Feed and Read summer program. This past summer, the program expanded from 2,000 children to more than 3,500 at-risk children participating at 32 sites located throughout Brevard. 13,000 food packs were distributed as well as 2,500 servings of fresh fruits and vegetables. The Project Hunger committee successfully raised $71,000 to fight childhood hunger during summer break. The Feed and Read program also distributed 16,000 brand new books to keep kids reading over the summer. Project Hunger raised an outstanding $75,000 in 2015. The result? More than 2,000 at-risk kids participated in United Way's Feed and Read summer program. Additionally, more than 12,400 back-pack meals were sent home. Thanks to the leadership of Project Hunger, United Way’s Feed and Read program introduced a pilot that also provided 2,380 servings of fresh fruits and veggies to children. The Project Hunger appeal raised $60,000 in 2014. The funds were used to buy food that fed 1,275 hungry kids during the summer weekends at United Way's Feed and Read program. Project Hunger funds were specifically used to purchase more than 8,860 back-pack meals that the neediest children received for at-home consumption. Funds raised during 2013 were put to use in a joint effort of the Face of Change, The Children’s Hunger Project, United Way of Brevard, and Project HUNGER. Thanks to Brevard’s generosity, we were able to assemble over 100,000 rice and bean meals and over 6,000 backpack meals to be provided to our elementary school kids that depend on free and reduced lunches. The meals packed were also distributed to children and families in need through our local pantries as well as United Way Summer Feed and Read sites. 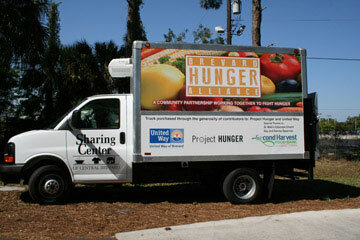 In 2012, the project took the first critical step to improving the overall logistics of food distribution to pantries with the purchase of a refrigerated truck. In addition, both the South Brevard and Central Brevard Sharing Centers now have walk-in freezers ensuring that our community can properly store and distribute much needed fresh and frozen items. And 4,382 meals were purchased and put into the backpacks of needy students in elementary schools with extremely high levels of students eligible for free and reduced cost meals. United Way of Brevard serves as the fiscal agent for Project Hunger and covers all costs associated with the appeal including printing and postage.